VANDENBERG AIR FORCE BASE, Calif. — The scene Sunday morning reminded me of a flock of pigeons waiting for breadcrumbs at a downtown plaza. About 25 journalists waited in front of the visitor's center, responding to the somewhat vague instructions received earlier in the week via official email from the Air Force. As I checked my camera gear for the fourth time — there was not much else to do — the Air Force media contact for the launch pulled up in a plain white van. She hastily arranged for the media to caravan onto the base behind her. We soon arrived at a gravelly bluff overlooking the launch site about three miles distant. The morning was spectacular, with the sky clear and cloudless, and the vast Pacific Ocean stretched endlessly to the west. Being at Vandenberg on the California central coastline is a bit like a mirror image of Florida's Cape Canaveral, except that it is rarely above 72 degrees here and one-tenth as humid. It was a fine morning for a launch. With equipment set and ready to go, I stalked potential interviewees. Since we had been banished to this windblown site overlooking the range, our only option was interviewing Air Force operatives, the few civilians among us and other journalists. SpaceX's improved Falcon 9 left the pad at Vandenberg Air Force Base on Sept. 29, 2013, at just after 9 am (local time). The press watched from a remote viewing site, as the blowtorch-like flame ascended. I pigeonholed 2nd Lt. Kaylee Ausbun, our public relations officer for the morning. She ran a good show under the conditions. It was nearing 9 a.m., the opening of a three-hour launch window, though the word had been passed that they were expected to launch at 9:21. The PA system droned on in the background, as system checklists were completed. "We're here to see the launch of the Falcon 9 rocket today," Ausbun said. "This is a historic event for Vandenberg, as this will be our third launch within a week. The last time this happened was 2004, when …" There was a flash in the corner of my eye and a rumble to the south. 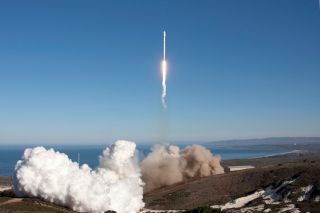 Journalists are less prone than others to cheering at such times, but smiles were everywhere as SpaceX CEO (and billionaire) Elon Musk's latest and newest version of the Falcon 9 rocketsuccessfully launched into a polar orbit, twisting to the south as it did so. "That was spectacular!" said Jim Spellman, formerly of Vandenberg's media operations and now head of the Western Spaceport chapter of the National Space Society. "It would have been even better with a countdown," he added with a smirk. And that had indeed been missing. While there was a count on the video stream delivered from SpaceX to the web, for some reason the PA system at the press site had apparently been tuned to an engineering audio loop. It made for some surprised faces a few minutes prior. "Like any launch, that was really exciting!" enthused Chris Jordan, a training officer at the base. "I train all the new engineers coming in and I trained a lot of guys out there on the pad," he added, "This launch was one of a kind, nothing else quite like it. We've been working with SpaceX, interfacing with their operations and making sure that they are robust enough to provide future launched for the government, and this success allows us to move on to other exciting missions. It will ultimately lower the cost of launch for the government." Jim Spellman later reflected on the events of the morning: "It’s been a long road for Elon Musk… a lot of folks had doubts about him and the company for some time, but he has time and again proved them wrong. This is a long-time vindication. We saw a culmination of this today with the first launch of the Falcon 9, version 1.1, being launched off the west coast, which has never been done before. It went off right on time, right as the launch window opened." Kaylee Ausbun, the Air Force officer in charge of public affairs for this launch, smiles with relief as SpaceX's improved Falcon 9 rocket departs the launch pad on Sunday. To her left is Jim Spellman of the Western Spaceport chapter of the National Space Society. "Hearing the sound of those engines, that deep rumble, and watching on this clear blue day, which is very rare this time of year, was truly awe-inspiring," Spellman added with a broad smile. Musk himself had calculated the odds of overall success of the Falcon 9 rocket test flight at something less than 50-50, and of the planned recovery system test at about 10 percent. The 22-story rocket was now longer, which introduced new torqueing forces to the structure. The diameter of the fairing at the top had been increased dramatically, and the engines were a new and more powerful design. And then there was the planned test of a new reusable rocket system, intended to eventually bring the first stage back to the launch site. "The most revolutionary thing about the new Falcon 9 is the potential ability to recover the boost stage, which is almost three-quarters of the cost of the rocket," Musk said in a later teleconference with the press. As it turned out Musk's predicted odds were right on target. While three of the first stage's nine engines did indeed restart during the reusable rocket test, upon re-entry it began to tumble, causing a centrifuge effect that starved the engines and ultimately caused the fuselage to break up before it could complete the task of fully testing the braking system. Nevertheless, the engine restart test was partly successful and the re-entry provided data valuable for future recovery attempts. "We probably won't be testing this on the next few flights," Musk said. "The fuel load for those flights is fully committed to the customers." But SpaceX will be testing it again, and this should eventually lower launch costs significantly, he added. "It went better than I expected, it was incredibly smooth," Musk said of the launch. Assembled members of the press watch as SpaceX's improved Falcon 9 rocket departs the pad on Sunday morning, Sept. 29, 2013, at Vandenburg Air Force Base, CA. Sunday's Falcon 9 launch was primarily aimed at testing the new rocket and sending the CASSIOPE space weather tracking satellite into orbit for the Canadian Space Agency. That satellite, and three smaller payloads, reached orbit safely. "It's certainly a huge relief to have successfully delivered CASSIOPE to orbit," he added. "It's been weighing on me quite heavily." After the launch, as I drove southward towards Los Angeles, I reflected on the incredible accomplishment of this young entrepreneur originally from South Africa. Musk, a co-founder of Paypal and Tesla Motors, and the founder of SpaceX, has accomplished much — not the least of which is challenging the established aerospace companies at their own game. And unlike those competitors, he accomplished the first critical phase of this undertaking with his own money, later garnering large contracts with NASA and clients like today's customer, the Canadian Space agency. That should be vindication enough for anyone. Editor's Note: This story was updated on Oct. 1 to correct the rank of 2nd Lt. Kaylee Ausbun.